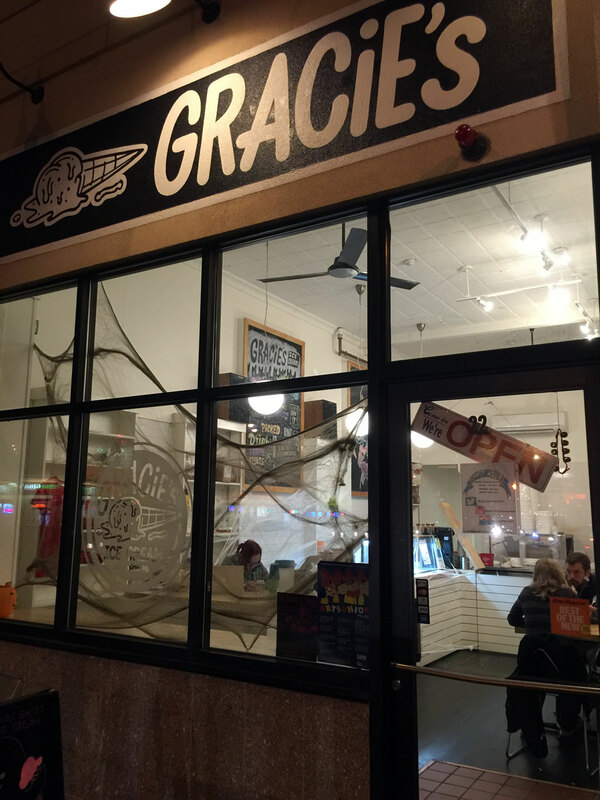 You can find Gracie's Ice Cream at 22 Union Sq, Somerville, MA 02143 in Union Square alongside India Palace. 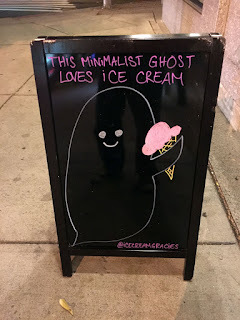 This is a small, independently owned ice cream shop easily accessed by foot traffic - I'm not sure about the parking situation but would assume parking can be found in side streets or small back-lots. While visiting Boston for a business meeting my and associate Sid and I discovered Union Square (upon the recommendation by someone at Tavern at the End of the World) and came upon India Palace, where we had a more than satisfying dinner. 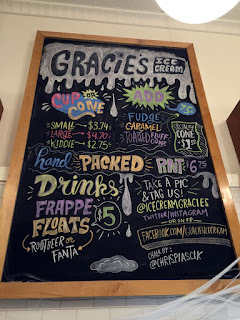 While standing outside waiting for the Holiday Inn shuttle I mentioned that ice cream would be the perfect end to our exploration - thus we found Gracie's quite by accident since it's located right next-door! 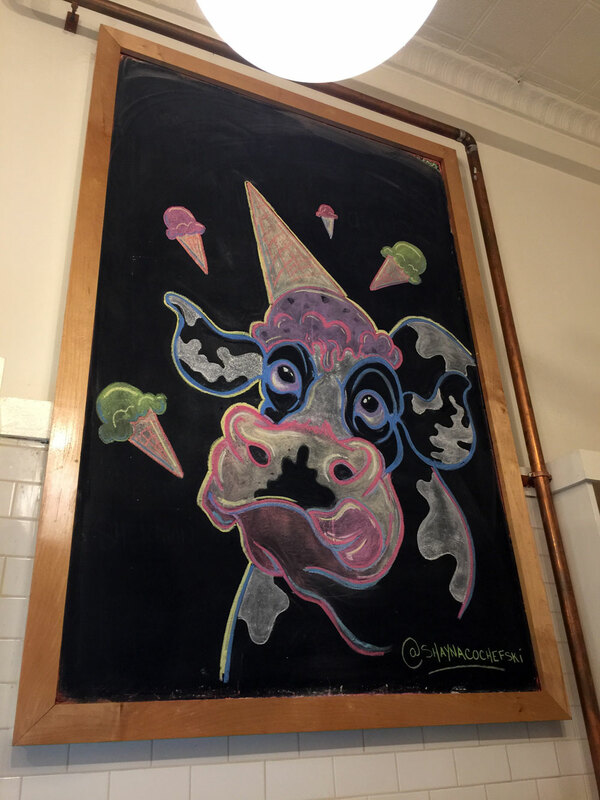 Walking into a small ice cream shop is interesting as you never know what you will find. 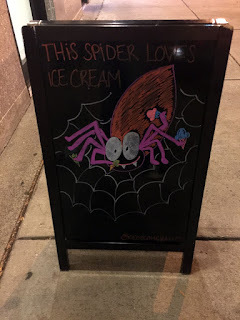 The outside of Gracie's in adorned by a folding sign with a couple of hand-drawn images that were quite fun and cute, with a Halloween motif (we were in Boston the week before Halloween). The interior continued with the Halloween decoration using the fibrous webbing that seems to be popular among locals. 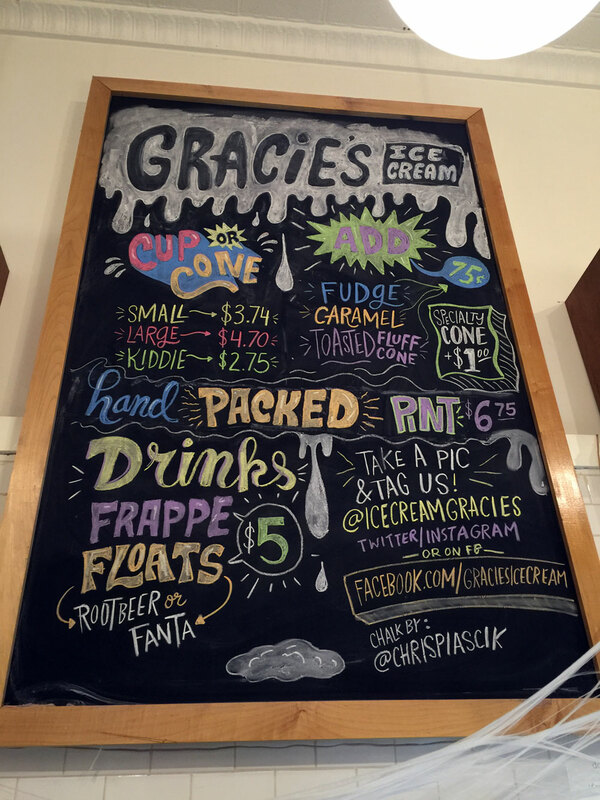 The artwork continued inside with hand-drawn boards behind the counter. After asking a few questions we each ordered a scoop on a sugar cone - I tired an interesting orange-vanilla that tasted like a Push-Up (which was described quite accurately to me by the person behind the counter (Gracie?). We ate our ice cream while waiting on our shuttle, which of course never showed up. When we called them back they replied "I waited and no one was there" - hmm. In any case, while waiting we had quite a discussion with, I'm presuming the owner that was interesting, mostly about the Union Square area and it's recent gentrification. She indicated that a local artist did the boards upon inquiry. 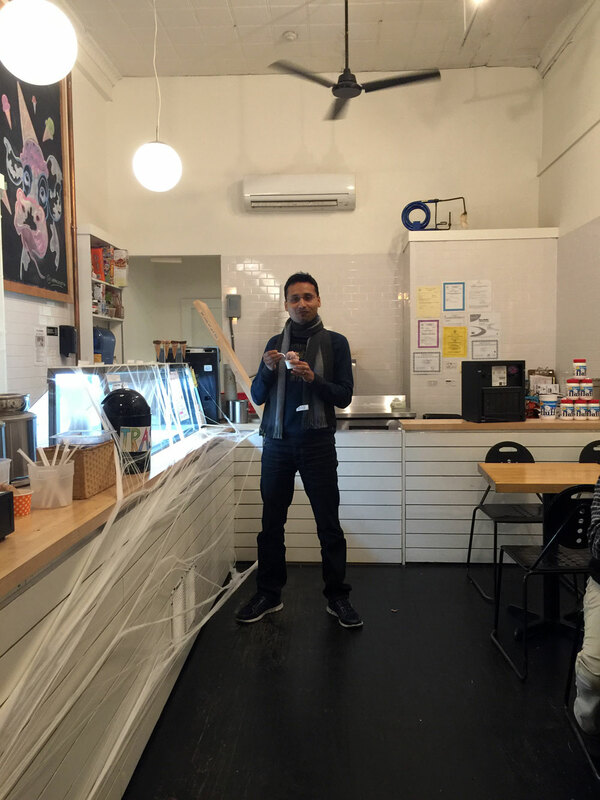 She was quite friendly and informative and provided fantastic service. 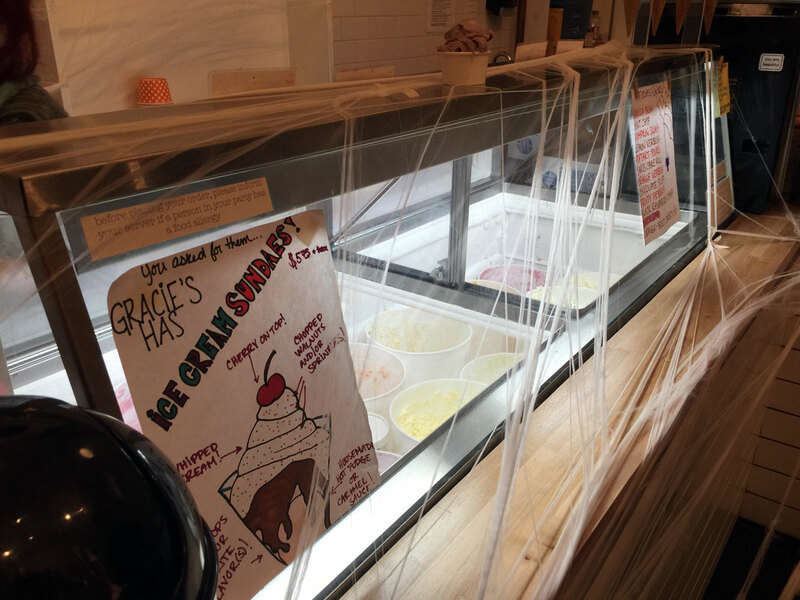 The ice cream was quite good with some interesting flavors - we'll try to hit Gracie's again the next time we're in Boston.